Travelling the country's lakes and rivers in a canoe is an iconic Canadian pastime but Alexandru Duru just might change all that with his new Guinness World Record-breaking hovercraft. 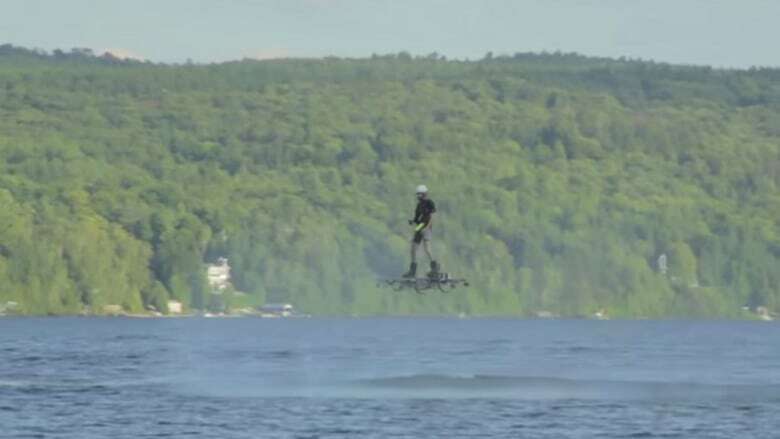 The Montreal resident used his machine to travel more than 250 metres — five times the previous record — at a height of five metres above Quebec's Lake Ouareau. That 250-metre flight has been officially confirmed by Guinness as a world record. A YouTube video of the feat had generated about 65,000 hits just a few hours after being uploaded to the site Friday. The software engineer said the record-cataloguing company was so impressed with his achievement it plans to include it in the 2016 edition of the Guinness Book of World Records. "To tell you the truth I always thought [flying] was something possible," Duru, 30, said in an interview. "When I saw the new high-powered motors I thought, 'We can do that!" ]Duru had been working on a prototype for about five years and last August filmed himself flying his new machine over the lake, which is about 130 kilometres north of Montreal, before contacting Guinness. Guinness verified the footage and announced the record on its website Friday. Duru and his business partner, Philippe Maalouf, hope to have a new prototype finished by the end of the year and then have hovercrafts available for purchase across the country. They negotiated a deal to manufacture the aircraft outside Canada and "are close" to finishing and testing the new model, Duru said. The majority of the funding for the research and development of the prototype came from the private sector, with some coming from the Natural Sciences and Engineering Research Council of Canada. He wouldn't say how much it cost to build but said the first generation of the machines will likely be "quite expensive." Duru hopes Canadians who can afford it will soon be able to have hovercrafts sitting next to their canoes, motorboats and other toys at the family chalet. "You can fly it anywhere, over water, in the wild," he said. But he warned it's not for everyone. "This thing is still quite dangerous," he said, because the pilot uses only his or her feet to fly the aircraft. He said the prototype that will be hopefully be for sale will be digitally locked and be able to fly only about1.5 metres above the ground. "He wanted to fly and he made it happen," said Maalouf, who handles the business side of their new company, All Terrain Hoverboards. Duru graduated from Ecole Polytechnique de Montreal and began designing technology for special effects projects, such as the New York show for internationally renowned stage director Robert Lepage. When Duru was 26 he designed the 3-D special effects for Lepage's live show at New York's Metropolitan Opera. "I told him to leave visual effects and make something that can change the world," Maalouf said. Both men like the movie Back to the Future, which was made in 1985 but set in the fictional world of 2015. The character Marty McFly flies a hovercraft in the film. "We have about six to seven months to put everything together," he said. "Ours is going to be a little bigger than the one in the movie, though."